Don’t forget to plan ahead! Moving with a cat or dog can be challenging, but it’s something that can be accomplished without any great hazards if done correctly. When moving day comes, it will be to your benefit to get everything done as efficiently as possible. Cats will need to be placed in a carrier. The best type of carrier for a cat or other small animal is one with hard sides for protection. Leave the carrier out for some time before the move so your cat can become comfortable with it. It’s usually less stressful for dogs to move, as they often enjoy long drives. If a dog isn’t accustomed to traveling by car, you should take him for a few drives before moving day so the experience isn’t too unsettling. If you have any concerns about your pets’ health, it’s a good idea to visit the veterinarian before moving in order to have any necessary prescriptions or care instructions ready. Your cat will be safe in a sturdy carrier. Ideally, the carrier should be kept near a person who can provide a little reassurance every so often. 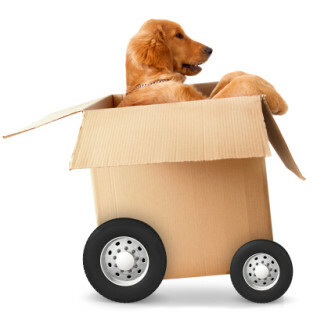 Don’t forget to bring pet supplies along for the move, whether you are taking along a cat or dog. This includes food, dishes, cat litter, a leash and any favorite toys or bones. If you are unable to personally transport your pet, it’s possible to use an animal relocation company that specializes in this type of service. There are some experienced and reliable companies which specialize in moving pets safely around the country and the world. Staying the night at a hotel along the way? If you stop at a hotel along the way, make sure you plan ahead and choose accommodations that are pet friendly. It is worth checking because even though the hotel brand’s website may say their hotels are pet-friendly, individual locales may vary. You don’t want to be in the position of having to make new plans because a hotel doesn’t allow pets. Some hotels that allow animals may have a size limit. Once you arrive at your new home, it will probably take your pets a few days to adjust. Walk your dog around the house and the property on a leash as soon as possible. After a few walks, a dog should feel right at home. Take necessary precautions of course depending on whether or not your dog will run off. Make sure to update tags as soon as possible. Cats often take a little longer to get comfortable. They often go into hiding, so don’t be worried if your cat keeps a low profile for a few days. Just make sure to leave food, water and the litter box in a convenient place so the cat can find them when they’re ready to come out. If it is an outdoor cat it is best to keep he or she indoors for a few days in order to get acclimated. No matter the type of pet, they are part of the family. And when you decide to move it is a huge undertaking for the entire family. Make sure to consider your pet’s plan in advance to avoid any last minute pitfalls. If you follow these tips and acclimate your pets accordingly they will be settled in and ready to play in no time.